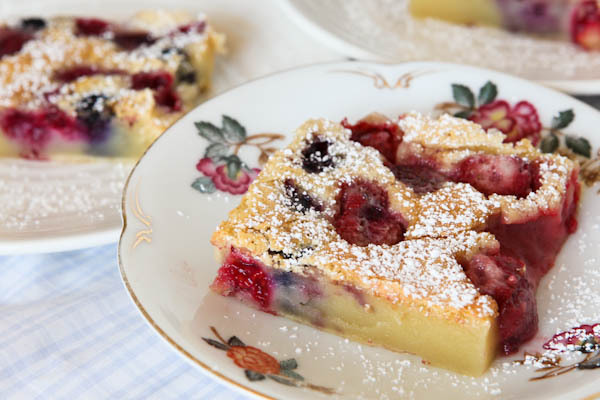 If you have no idea what the heck a clafoutis is, don’t worry. It sounds complicated and fancy. But it’s easy and only seems fancy. 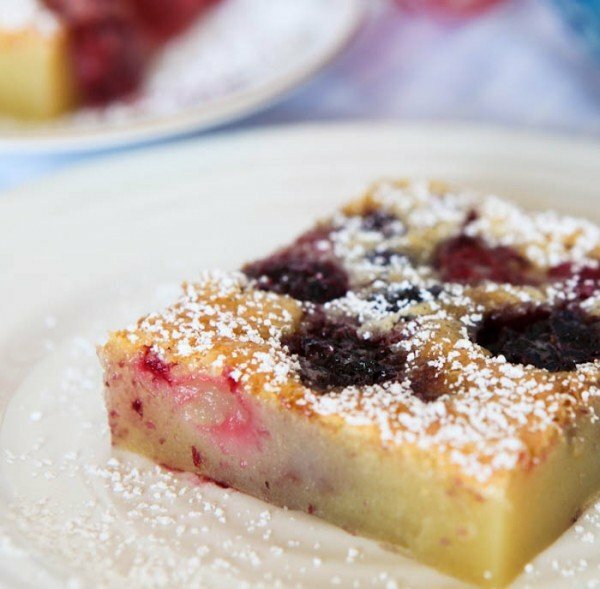 Clafoutis: cla·fou·ti or cla·fou·tis (klä-f -t ) n. A baked dessert composed of a layer of fresh fruit topped with a thick batter. 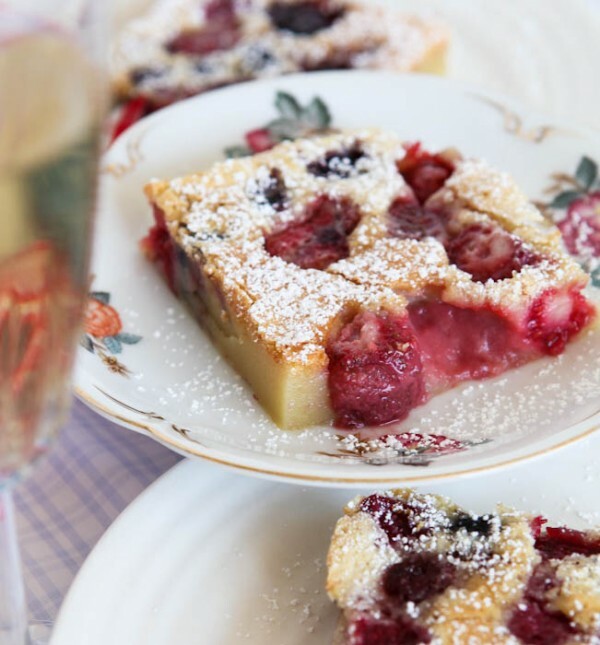 Typically it’s made with cherries and dusted with powdered sugar. 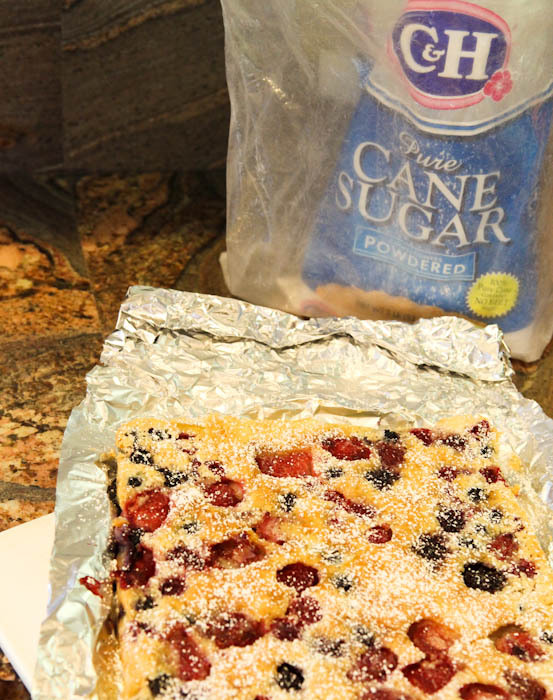 I used mixed berries and put extra sugar in the recipe compared to other recipes I had browsed, as well as the dusting of powdered sugar I used on top. You can never have too much sugar. Or cream. Or butter. Or oozing, luscious, juicy baked fruit. 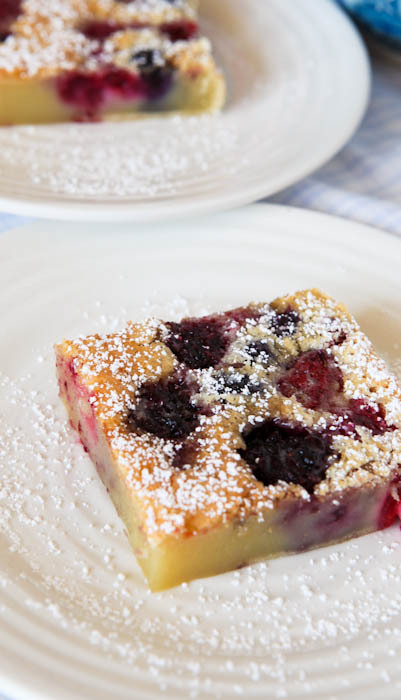 I didn’t know what a clafoutis was until I was pregnant with Skylar and watched lots of Food Network while trying to forget about how sick and miserable I was for about 38 weeks or so, but I wasn’t counting. 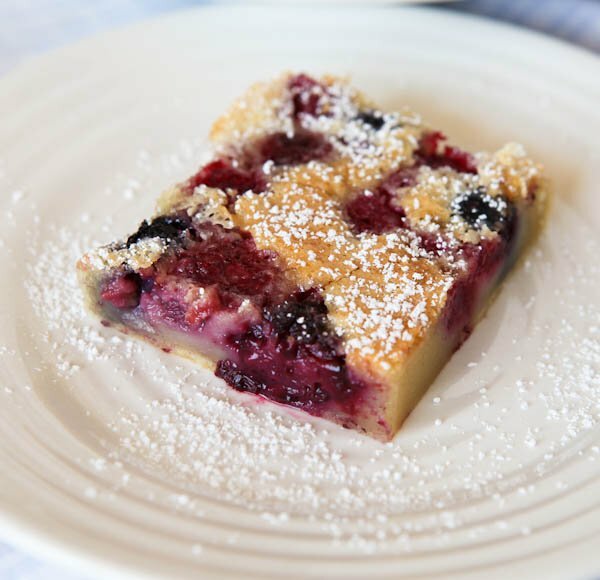 I was so intrigued by an episode similar to this one with Dave Lieberman where he made a blueberry clafoutis that I actually made one. And I’ve spent five years remembering how good it was. And after making this one, I have no idea why I didn’t make it sooner! 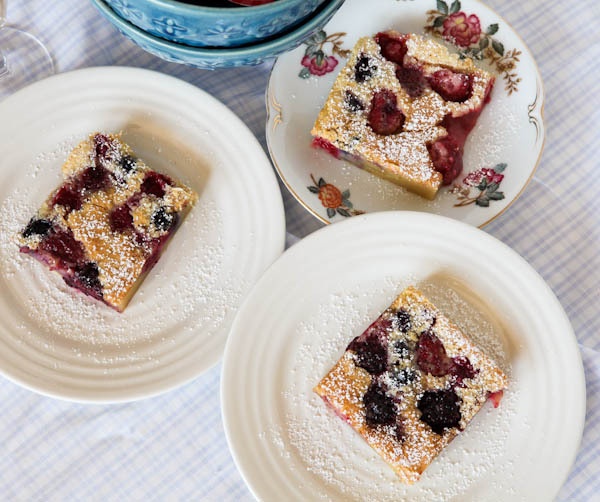 Probably because French desserts scare me off because they seem so fussy to make, but this clafoutis is neither tricky nor fussy. And tastes wonderful, creamy, sweet, and glorious going down. 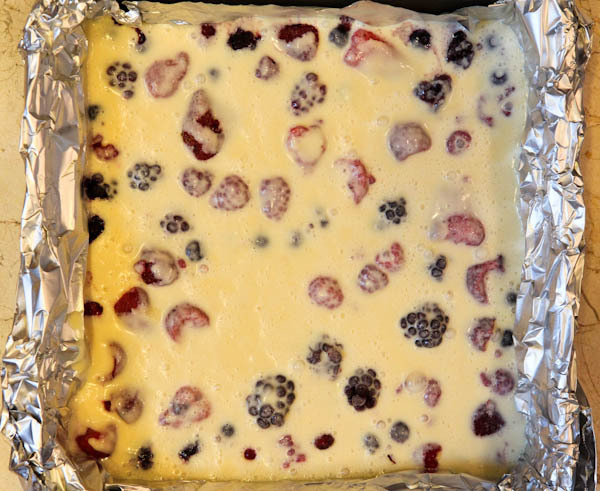 Layer the berries in the bottom of a greased, sprayed, or foil-lined square baking pan (i.e. 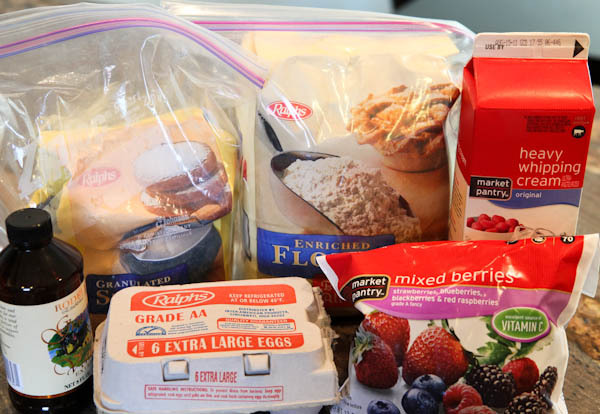 8×8 or 8×10) Take all remaining ingredients (except powdered sugar) and either whisk by hand to combine or add all ingredients into a food processor, blender, or Vita and blend until incorporated (took 30-45 seconds in the Vita). Pour mixture over the berries. Bake at 350F for 40 minutes or until top is golden brown, puffy, and has a firm center that is fully set and that bounces back when lightly pressed. 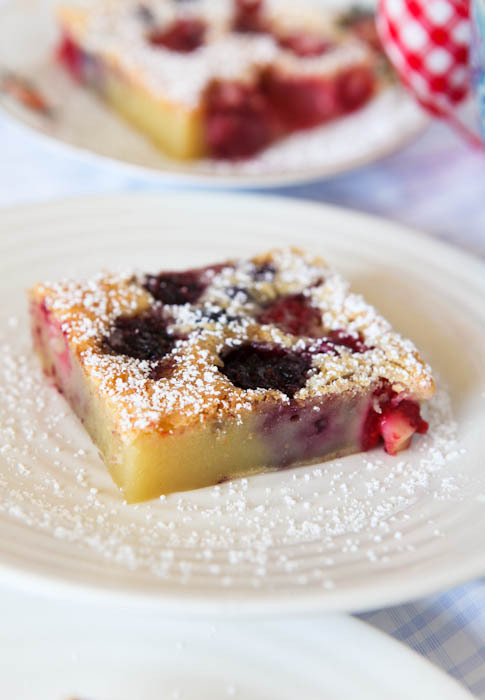 Let the clafoutis cool slightly before dusting with powdered sugar. 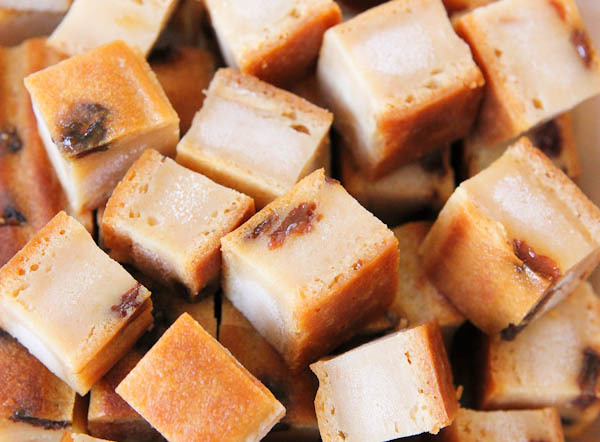 Slice into pieces and serve semi-warm is traditional. 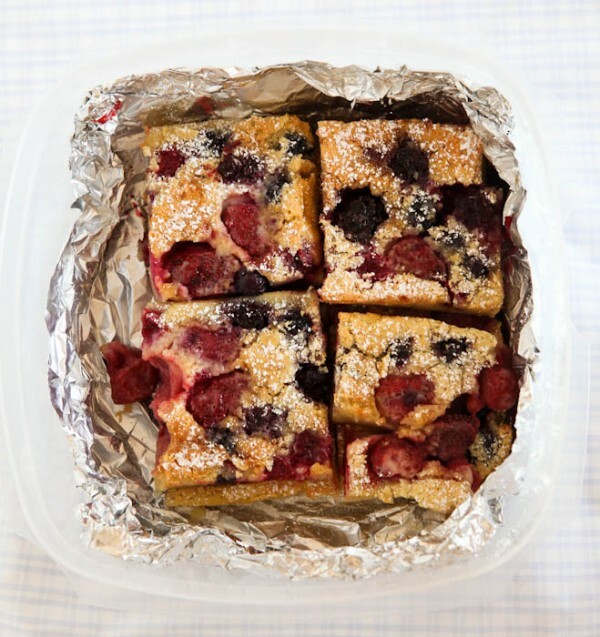 I store the leftovers in the fridge (or freezer) and allow them to come to room temp before eating. This is the 30 second batter. So.Easy. Rich, decadent, creamy, sweet. 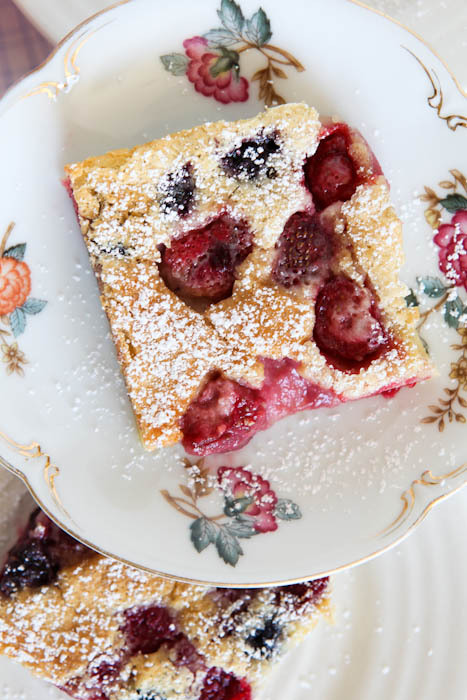 <—Everything a dessert should be in my book. 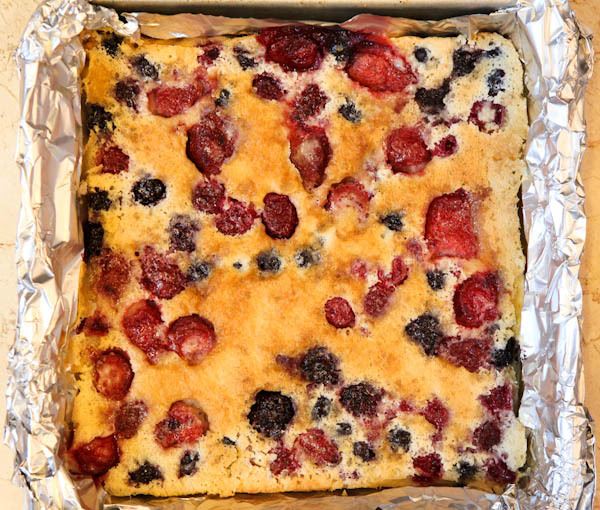 I firmly expect to make another clafoutis, and much sooner than 5 years from now, which is how long it took between clafoutis #1 and #2. 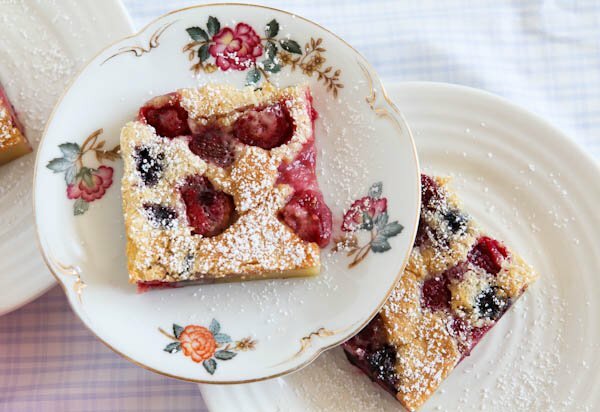 You know, real “light and airy” desserts. Kidding. 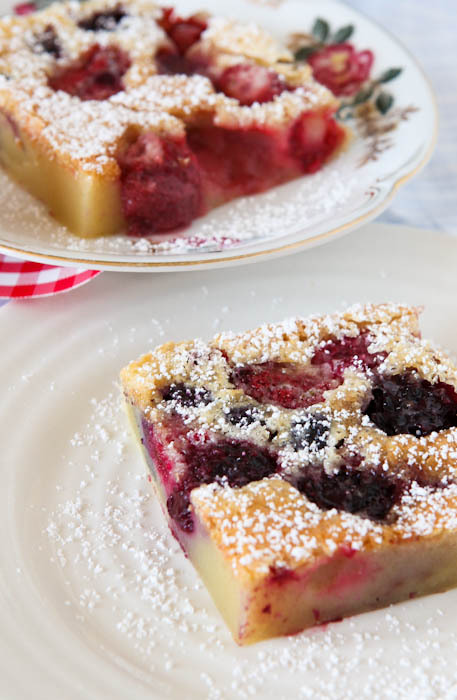 It’s pretty much heaven in your mouth with sweet, baked cream and juicy berries exploding in your mouth with every bite. I think you will impress anyone you serve this to. And just in time for 4th of July, Red, White, and Blue! I guess I’ve officially turned food blogger when I create seasonally-appropriate and holiday-themed recipes, huh. 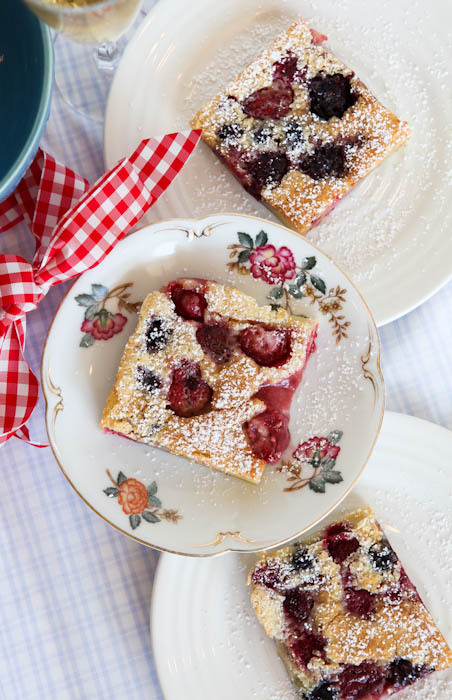 It doesn’t have to be 4th of July to enjoy this rich slab of goodness, though. If you happen to have any leftovers, hoard them for yourself store them away from hungry family members in the fridge or freezer in an airtight container. This is almost all gone. I always said I love leftovers! From my last post, thanks for the compliments on my new camera strap and oh yes, we all seem to love Etsy! And it was fun to hear what your ‘signature’ colors are that you gravitate toward. 1. 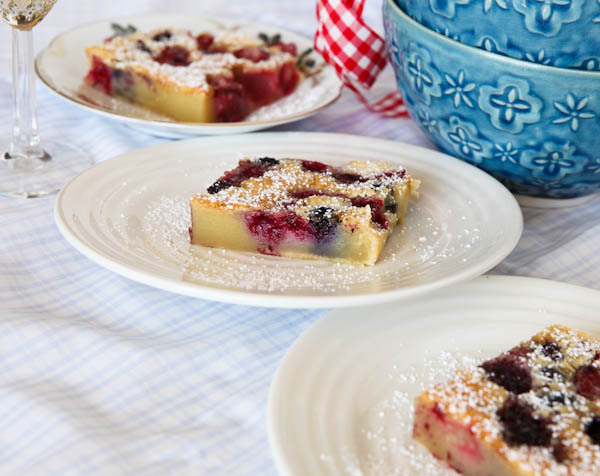 Have you ever tried a clafoutis? As I mentioned, I had only had the one that I made five years ago when I was pregnant. 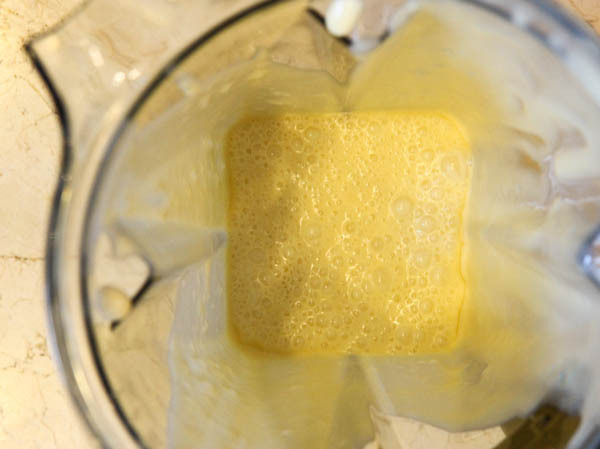 It’s about as easy as making pancake batter but with far more amazing results than pancakes! But don’t take my word for it, in 5 minutes, you can have the batter made and then just pour and bake. And enjoy. 2. Do you have any fancy tasting or fancy sounding recipes you’re fond that actually aren’t fancy or fussy at all? I pride myself on being able to take complex recipes, and break them down, removing all but the key and absolutely essential ingredients because when I see a recipe that’s more than a half dozen ingredients or has a many steps and makes tons of dirty dishes, I am instantly turned off. Skip it. Next. I am picky choosy when it comes to desserts. They must be stellar and decadent and fabulous, or they’re not worth my chew. And never “healthy tasting”! Why bother. 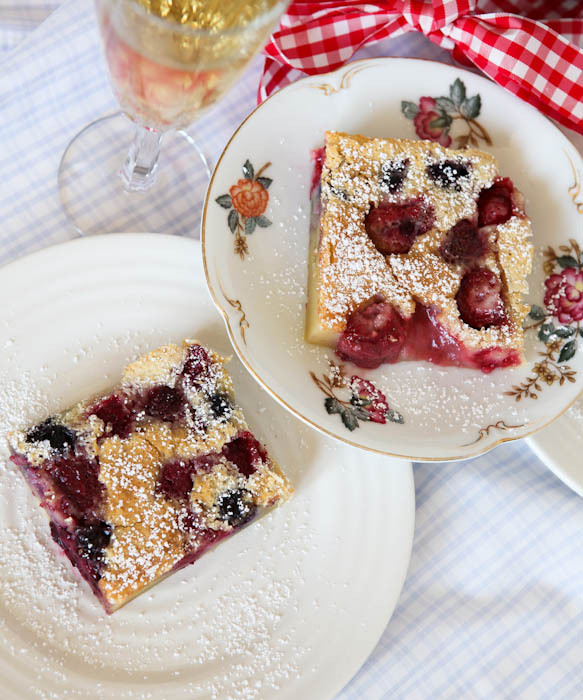 So my recipe for success with desserts is: fancy & decadent tasting + very user-friendly & easy to make + commonly sourced & inexpensive ingredients = at least 95% of the recipes on my site. And not only desserts, but that’s my overall approach to recipes. What are your taste fancy and fussy but really aren’t recipes? Don’t forget about the Shaklee Giveaway and Happy 4th of July! This looks really yummy to me. Thank you and have a great day! I made this earlier today to have with tea and company this afternoon. It was great and everyone liked it a lot. 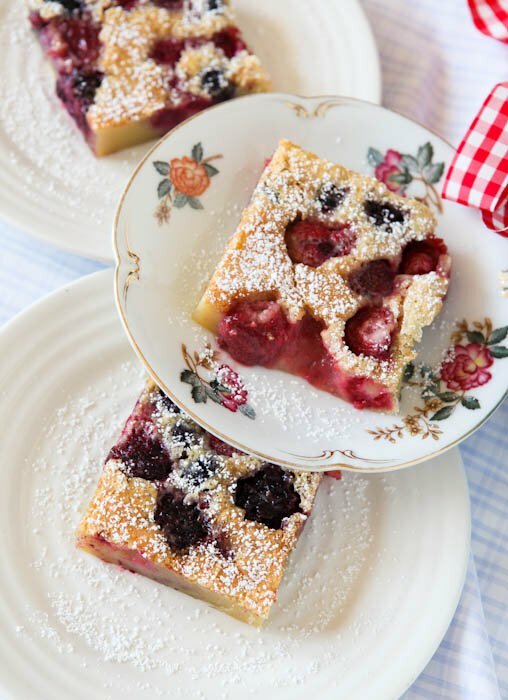 I lessened the amount of sugar to suit my guests’ tastes, yet it was still sweet from the berries and delicious and worked well. 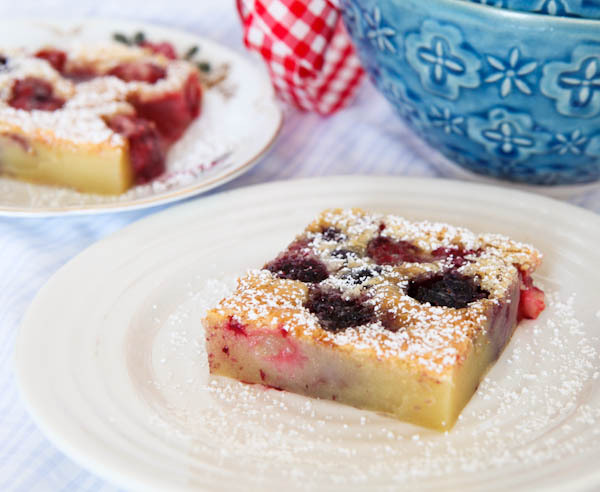 I used a blend of cherries and berries from TJ’s. So glad to hear you enjoyed this! I have a post going live in 10 minutes with the cherry/berry blend from TJs! Come back and check it! 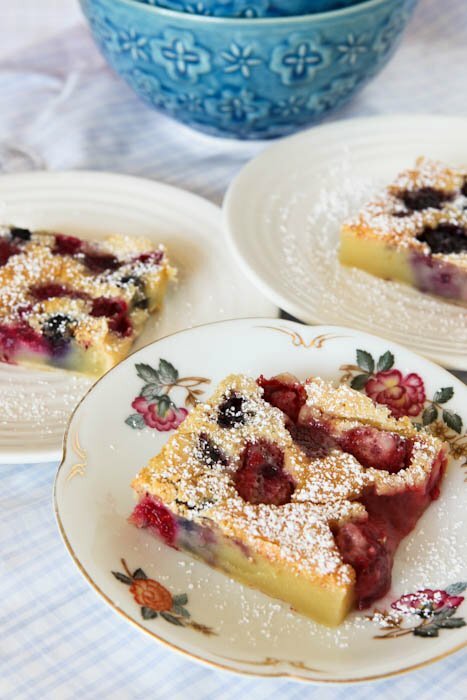 So happy to hear you tried this clafoutis and if you like things along this line, you can also try this one! As photographed in this post (it’s 3 years old) this was frozen but over the years I’ve made it with fresh, frozen, and a combo. Enjoy! This is such a cute website, and you should be very proud! I always turn to your recipes because I know they will be awesome. Thank you so much! Do you think it would be ok to add some macadamia nuts?